Tonight we went from value to limited color. The bridge was an all-evening demonstration by Jennifer with the live model, Candice. Jennifer lectured about the color wheel. Then she mixed a palette with the five hues that worked for her. Those paint mixes she applied to a painting sketch on a canvas, of the live model. The paint was applied in accordance with the value relationships we had trained to identify in the previous three sessions. Long story short, she painted the values in color, not gray-scale. The difference between monochrome and limited color palette is as simple, and as complex, as that. Nothing more. Balkan worked nonstop, as she had before. She took about half an hour to mix her palette and two hours to complete the painting. I looked at the mixed palette and was frightened almost to death. Five colors had been combined, mixed, and blended to a huge forest of subtle and diverse hues. 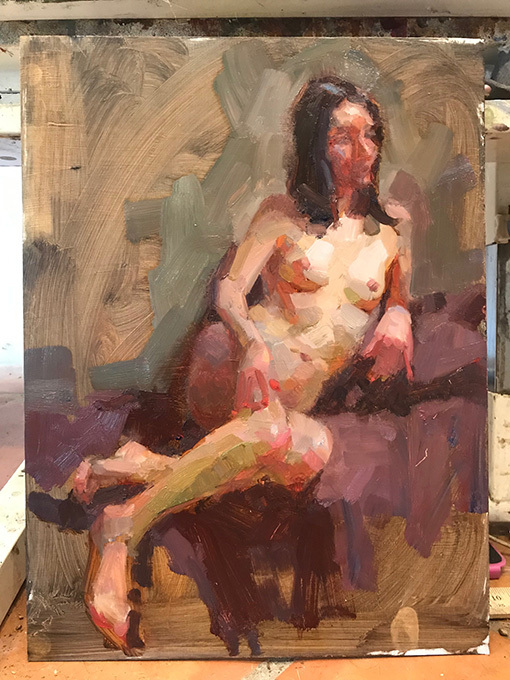 I took copious notes, but I despaired of mixing anything that diverse myself, much less applying it to a painting systematically with the values of light on a model’s flesh. Then, with Jennifer lecturing the whole time, the paint on the palette brushed on to the canvas and it all worked. Jennifer demonstrated the systematic application of paint, summing to a very successful figurative painting. She also showed how all the colors on the palette were on the painting, and all the colors harmonized by being placed correctly in their value relationships. We ran over our class time by a few minutes and as always, I was exhausted. I had stood on my feet and walked around nearly the whole session. It was arduous work paying strict attention the whole time, but I felt encouraged to apply Jennifer’s secrets (open to anybody) to my own paintings in the rest of the sessions.